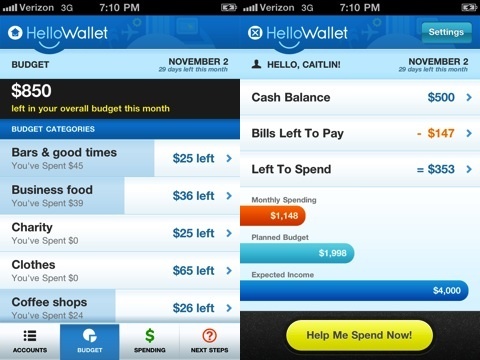 HelloWallet, made by a developer of the same name, is an iPod Touch and iPhone app that is made to help you spend less money and to help budget your earnings so you ensure you always pay your bills on time. 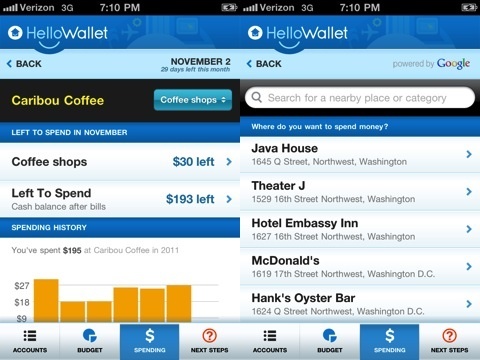 Not only that, but this application also has location-based services to further improves its budgeting capabilities. Read on and see if this app is a good fit for your Apple device. Everyone has to spend money on bills and other expenditures. To start out, you have to enter all of the money you have to spend each month. Not only that, buy you also have to enter the amount of money you make in that month. This program will then compare your bills versus your amount of money and it will show you how much is left over. But it doesn’t stop there. It will also go day by day, showing you how much money you should have based on your finances and when bills must be paid. Due to this, you also have to enter when you get paid and when your bills are due to ensure the figures are accurate. Not only does this program help balance your finances, but it also provides location-based finances. Another thing you have to do when you setup your financial profile is enter the places where you spend money. This program will then track that money spent, and it will show you the overall amount you have spent since using this program. It really helps to know how much you spent at McDonalds or Staples this month, and those figures alone may help you stop spending excess money. To keep things accurate, you should enter all your transactions to ensure the money is going down properly, especially if the money spent is not a planned expense. While it was a little annoying at first to enter these transactions, it became second nature after some time. This program has great security to ensure that no one goes through your transactions. You have to enter a PIN and all the transactions are encrypted to ensure that no one can easily find out this data. If there are any weaknesses to the program, it’s that unexpected expenditures have to be manually entered. If you are not honest about these figures, then the program will no longer be accurate, so be sure to write down every transaction as it happens. When it comes to saving money, few programs are as intensive as HelloWallet. You will easily find out how much you spend, how much you have and you will always have a great snapshot of your current finances to look at. AppSafari review of HelloWallet was written by Darius Reimm on December 20th, 2011 and categorized under App Store, Finance, Free. Page viewed 4543 times, 1 so far today. Need help on using these apps? Please read the Help Page.